This is one of my favorite post workout smoothies. I never feel like spending too long in the kitchen after an exhausting workout, which is why I usually choose to whip up a smoothie in 5 minutes or less. I also like to make a smoothie before heading off to the gym and drink half before and after. Chocolate and peanut butter are a dynamic duo. You can use peanut butter instead of almond, but your smoothie won’t be quite as healthy. This is one of those smoothies that’s so decadent I have to remind myself that it’s actually very healthy. With almonds being front and center in this recipe, let’s touch on a few of their health benefits. A quarter cup of almonds contains about 8 grams of protein. Almonds are high in vitamin E and manganese, and a good source of magnesium, tryptophan (boosts levels of the feel-good hormone serotonin), copper, vitamin B2, and phosphorus. Manganese and copper help with energy production. The monounsaturated fats found in almond have been shown to reduce the risk of heart disease and lower LDL (bad) cholesterol. Besides being great for your heart, almonds offer protection against diabetes by reducing after meal surges in blood sugar. Studies have shown diets high in nuts like almonds may help you lose weight. Lastly, almonds help prevent gallstones and daily consumption of almonds may help you eat a healthier diet overall. Sounds like almonds might need to be categorized as a superfood. This is also a great dessert smoothie. If you have a strong enough blender you can reduce the liquid this recipe calls for and make more of a pudding, or ice cream with use of a frozen banana. Enjoy! Put all the ingredients into your high speed blender and blend for around 45 seconds or until the desired consistency is reached. I’d love to hear what you think of this chocolate almond butter smoothie in the comments below. Happy Blending! I made this and added strawberries, yum! Strawberries, yum! I just updated the recipe to include strawberries as an Add-on. Thanks for sharing, Madeline. Hey Erin, that’s awesome that you dig this smoothie, thanks for sharing, it’s a tasty one :) I haven’t made it in a couple weeks – need to grab almond butter from my co-op. Cheers! My preferred add-on is just a handful or less of frozen raspberries. YUM. It was amazing! I felt like I was drinking dessert for breakfast! I made it two days in a row! Yesterday I added 3 cups spinach and about 1/2 cup water and some ice cubes. Ended up being about 32 oz and I stayed full for hours! Thank you again for the awesome recipe! I’m telling everyone about it!!! Excellent! That’s how smoothies are suppose to taste – like dessert. Nice to hear you’re modifying the recipe and making it your own. First link that came up on Google searching for a protein smoothie with what I had in the fridge. I had no banana, but I used 1.5 cups regular milk, 2 scoops vanilla protein powder, 3 Tb vanilla almond butter, ice, 1 TB chia seeds and some ice – it turned out delicious! A little higher on the calorie count, probably, but not a disaster, haha. Thanks for putting something simple out there for folks like me to find! You’re welcome, Jeremy. Glad that Google pointed you to my site and that your smoothie was delicious. I wouldn’t worry about calories from good food. Just bought a Vitamix few weeks ago, haven’t really experience too much yet but looking at some of your recipes and will try some of them. Looking at the chocolate almond butter smoothie recipe and one of the ingredient, Maca? What is it and is it necessary to add it. Will it make a difference health wise? Dates are a great option to sweeten the smoothie too, just add 1 or 2 dates and delicious. Use instead of honey or other sweeteners though. Yes, dates are a healthy sweetener, Natacha. Hi,i have all of the ingredients to make your chocolate almond butter smoothie recipe and i will make it in my blender a day after i make your harvest time sweet potato smoothie which i am going to make it this morning before i go to my church to help out at the ezra party dinner and i am haing dinner at the church this evening.i will let you know what i think of this smoothie and what it tastes like. 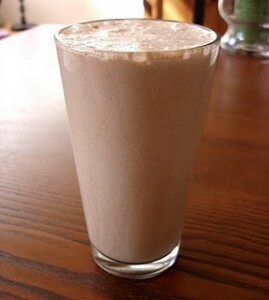 I think you’ll enjoy this chocolate almond butter smoothie, Kim!